Summer vacation, 2012. Quick snacks and smoothies! | Fat girl gone RAW! Summer vacation, 2012. Quick snacks and smoothies! Things around here have been pretty intense since school let out last month. My 3-year-old was only going 3 hours a day, but what a world of difference that made for me! Now I am scrambling around trying to get everything done without that time. It’s a challenge! I’m learning to get a little more organized with my daily tasks, such as shopping and cooking, so that we have plenty of time for fun activities. In the spirit of making things easy (at least in the food department), I signed up for a membership with Costco. This will allow me to continue to buy organic foods, and in larger quantity. My daughter can go through 4 pounds of grapes in just a few days! It was fun to make a shopping list, then go on the hunt for our “bargains.” One thing I have learned with this method is that I can only get certain organic produce at Costco, and the rest I have to find at my local health food stores. The nice thing about buying produce in large quantities is that I never have an excuse to eat unhealthy food! I buy large bags of spinach and use it daily in my smoothies. I buy the large containers of fresh, organic fruit and my daughter will munch on fruit throughout the day (instead of looking for sugar-loaded substitutes). Having fresh foods around also inspires me to create new things! 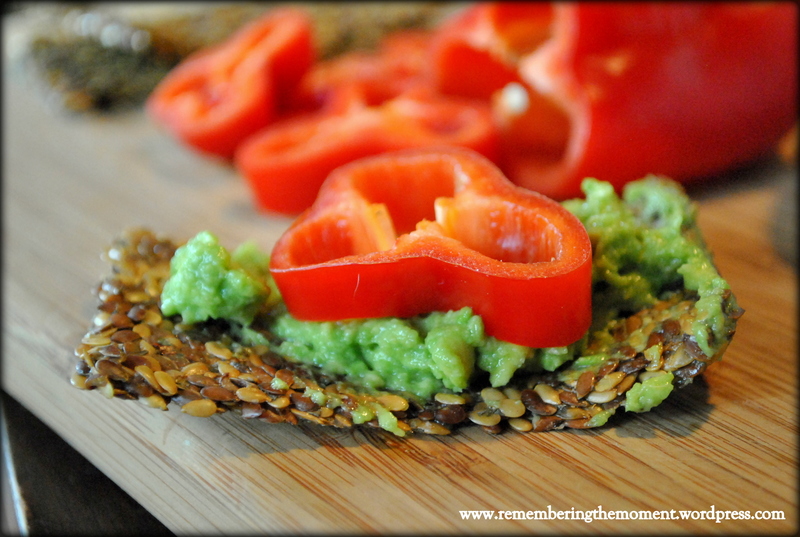 Here are a couple of ideas for a quick snack or lunch! My local farmer friend grew these incredible red peppers! They are sweet and crunchy and just bursting with flavor. They also were very pretty once cut. I created a meal that is fantastic on hot, summer days. Not too heavy, but very satisfying. 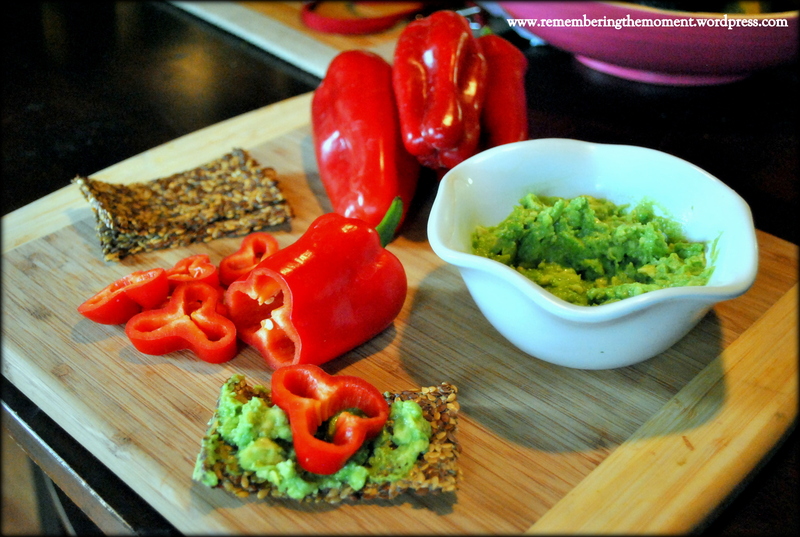 The flax crackers are raw, and come from a company called Dr. in the Kitchen. I buy the savory flavor, but there are several types to choose from. I found these crackers at my local Whole Foods store in the “raw” food section. I sliced one pepper and put the pieces to the side to use as scoops. I also saved some to use as decoration (see photos). 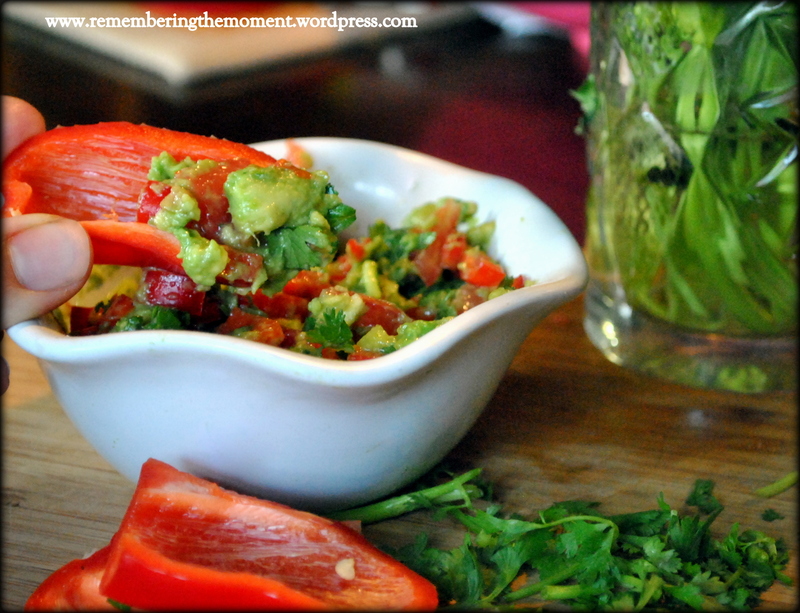 The rest of the pepper was diced into small pieces for the guacamole. Our next recipe evolved after my daughter asked if we could go to Sonic for drinks. I asked her what she was craving, and she said strawberry lemonade. We looked around the kitchen to see if we could come up with a fresh alternative, and sure enough – we found all the ingredients, plus an extra special bonus! Watermelon juice can be quite sweet, and I like to juice the outer rind along with the flesh to balance the sweetness and for maximum nutritional value. Watermelon has a 92 percent water content and is high in vitamins B5 and C, beta carotene and folic acid, with lesser amounts of vitamins B1, 2, 3 and 6. Watermelons also contain calcium, magnesium, lycopene, phosphorus and potassium. Visit Livestrong.com to learn more about the benefits of juicing watermelon! I juiced the watermelon and rind earlier in the day, so I had it on hand, but you can always use whole pieces of watermelon without the rind for this recipe. It will still taste amazing! Add watermelon juice, mint leaves (optional), honey and stevia (if using) and the juice of both lemons to your high-speed blender. Blend on high until smooth. 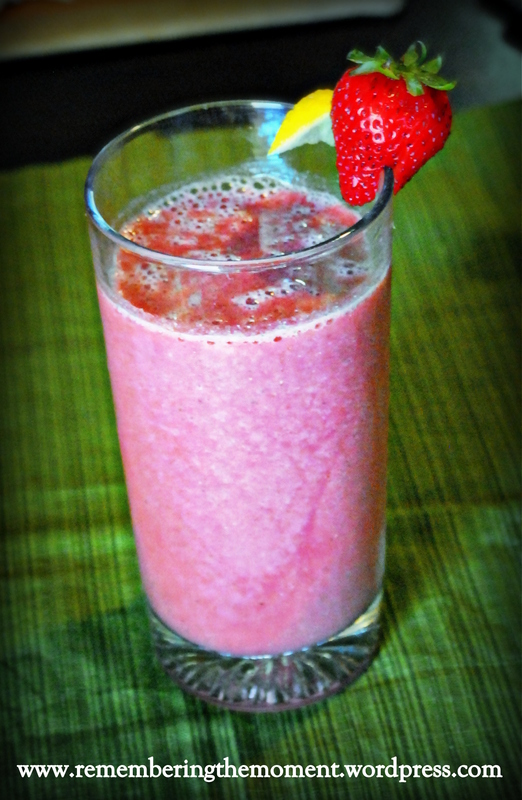 Add frozen strawberries and blend again. Add coconut water or just regular water if needed to thin. Enjoy! « Cool off with fresh juice and smoothies!